The Pittsburgh Penguins made waves with a big move prior to Tuesday's trade deadline. The Ottawa Senators waited until a day later to make theirs. With one game to judge, both teams are still waiting for the changes to pay off. Ottawa seeks its first win with Bryan Murray back as coach on Saturday when it hosts Pittsburgh, which lost new acquisition Marian Hossa to an injury in his first game as a Penguin. Pittsburgh (36-22-7) made a surprising splash on Tuesday, sending three players and a draft pick to Atlanta for Hossa, a five-time All-Star who played his first seven NHL seasons in Ottawa. But Hossa's debut lasted less than two periods. He banged knees with Boston's Glen Murray during the Penguins' 5-1 loss Thursday, suffering an MCL sprain that will keep him out a week. "It was an accidental hit, knee-on-knee," said Hossa, who registered one shot in 10 minutes of ice time. "This is disappointing. I was trying to get comfortable with my linemates. But injuries happen, and this is the tough luck of the business we're in." It was the Penguins' worst loss since the New York Rangers beat them 4-0 on Dec. 18. Ottawa (36-23-6) didn't make a major move at the trade deadline, but a 4-0 loss to Boston on Tuesday prompted the team's general manager to make a big change nonetheless. Murray, who was behind the bench last season as the Senators made their first trip to the Stanley Cup finals, fired coach John Paddock on Wednesday and will coach the team for the rest of the season while maintaining his front-office duties. "Whether it was fair or unfair, I just felt I want to be the guy here and I'll take the responsibility," Murray said following the defeat to the Bruins, the team's second shutout loss in a row. "I'm not afraid of that." Murray's season debut didn't go much better. The Senators lost 3-1 at Philadelphia, marking the fourth time they've lost three straight games in the past six weeks. Ottawa is 6-11-2 since Jan. 19. "I see lots of things that have to be done, but it's kind of where the action is and I didn't mind it," Murray said. "It's not something that I was really looking forward to doing, but in a couple of days, I'll feel better about it, I think." The Senators' biggest win in recent weeks also may have been the Penguins' toughest loss. Pittsburgh had won three in a row heading into a home meeting with Ottawa last Saturday and led 3-0 midway through the second period, but the Senators fought back to win 4-3 in overtime on Daniel Alfredsson's 35th goal of the season. Evgeni Malkin went scoreless in that contest, snapping a 10-game point streak that had helped him take over the NHL scoring lead. He's failed to produce a point in three of his last four games. Hossa is now in line to return to the Penguins' lineup around the same time as reigning Hart Trophy winner Sidney Crosby, who has missed six weeks with a high ankle sprain. Despite Crosby's absence, Pittsburgh had scored a power-play goal in 13 straight games before being shut out in three opportunities against Boston on Wednesday. The Penguins are converting 21.5 percent of their chances with the man advantage, among the top five in the league. Ottawa, meanwhile, has scored just twice in its last 31 power-play opportunities, and the team's top scorers have been in a funk. 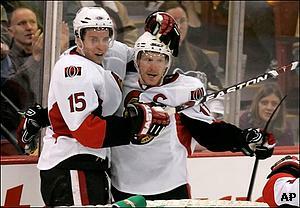 Alfredsson's goal against Pittsburgh was his only one in the past nine games. In that same span, Dany Heatley's only two goals both came in the win over Pittsburgh. The Senators have won two of three meetings this season, with both victories coming in Pittsburgh. The Penguins have won their last three visits to Ottawa.